World Coin Collecting: Why collect world coins? One of the most common questions I get about collecting world coins is simply "Why?". Why collect world or foreign coins? In answering this question, I'm going to discuss what I've found to be the best aspects of a world coin collection so that you can decide for yourself if it's something you might like to try. As its foundation, a collection should interest you. If you're not interested in what you are collecting, you're not going to keep at it. At various times in my life, I've collected: rocks, stickers, baseball cards, toy cars, Star Wars figurines, Pez dispensers, stamps, shells, US coins, world coins, Smurf figurines, posters, bus schedules, comic books, and bottle caps. And those are just the ones I can remember. Each of those held my interest for long enough to start a collection, but I eventually grew bored or frustrated with most. I think that's normal. Your interests and your interest level changes over time. What you find interesting or exciting at age 10 doesn't have to be the same as when you're 15, or 20, or 40. My coins are the collection that I've come back to time and time again - they interest me, and I get excited about them, so I want to maintain my collection. My bottle caps, on the other hand, were discarded long ago. I think that coins, and especially world coins, have many features that make them a good collectible. Coins are small and easy to store. 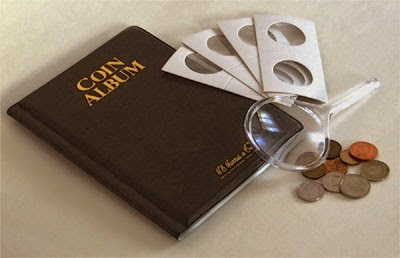 A simple 3-ring binder with pocket pages can hold hundreds of coins, and takes up about as much room as a Harry Potter novel. A collection of hundreds of toy cars would take up an entire toy box. World coins are diverse. They come in many different colors, some with 2 colors on the same coin. There are round coins, square coins, multi-sided coins, scalloped coins, and coins with holes in them. They have pictures of animals, plants, people, buildings, kings, queens, presidents, and more. There are so many different kinds that you can focus on a specific type of coin, such as coins with animals or coins from South America. (I collect everything, but my favorites are 2-color coins and square coins. I haven't found a 2-color square coin yet.) Check out Portland Coins' coin identification picture gallery to get an idea of the variety that world coins have. Coins are inexpensive. Coins and coin-collecting supplies don't cost a lot, so it is easy to start and maintain a collection without spending much money. As you become a more advanced collector, you may want to splurge on more expensive rare or valuable coins, but you don't have to in order to enjoy collecting. Coins are everywhere. There are more than 190 different countries in the world today, most with their own coinage and many years of previous coin styles that can be collected. That means you'll never run out of coins to put in your collection. These are the main reasons that I enjoy collecting world coins. If this sounds interesting, think about starting your own collection, or getting someone else (a child or friend) started. In my next post, I'll discuss the tools and supplies you'd need to start a world coin collection.